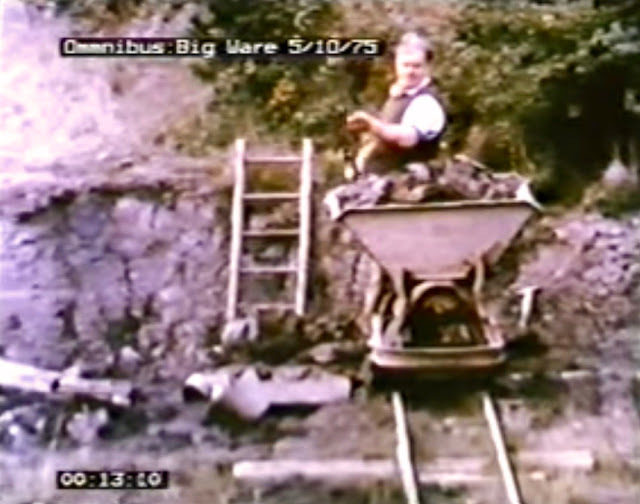 In the 1970s and 80s, David and Sally Shaw-Smith made a series of 37 films for Irish Television company RTÉ that documented the work of people still pursuing traditional crafts in Ireland, "where the emphasis is on the skill of human hands rather than on machines." Beautifully, the title of the series was, simply, Hands. One of the episodes focusses on Carley's Bridge Pottery in Enniscorthy, County Wexford, the oldest pottery in Ireland, founded in the 1650s by the Carley brothers, originally from Cornwall. Travelling in search of a site for their new pottery, they settled on Enniscorthy because of the quality of the clay they found there. It is the same clay that we see being dug out of the ground in the film. 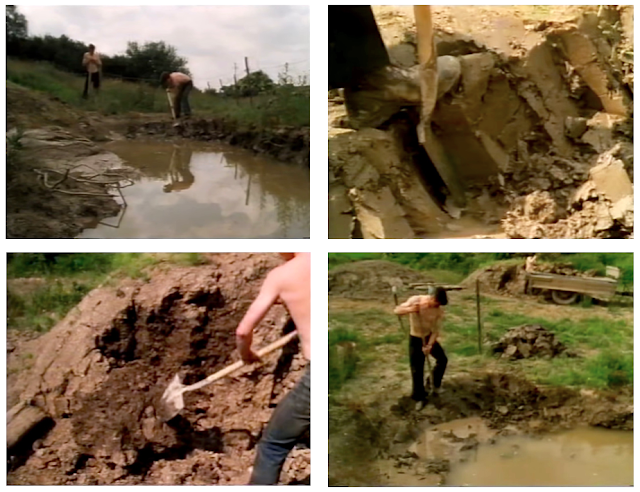 A strikingly large amount of the documentary is devoted to the back-breaking labour of digging up and preparing the clay - repetitive, tiring work, carried out here with quiet skill and precision. The filmmakers were obviously captivated by the process. Drudgery, in the hands of skilled, hard-working people, becomes worthy of our attention. It is a beautiful, gentle film that quietly celebrates a working pottery in the country tradition - using material sourced on-site in order to produce humble domestic wares and plant pots for the local community. Pots with an intended use and a healthy, ready market. 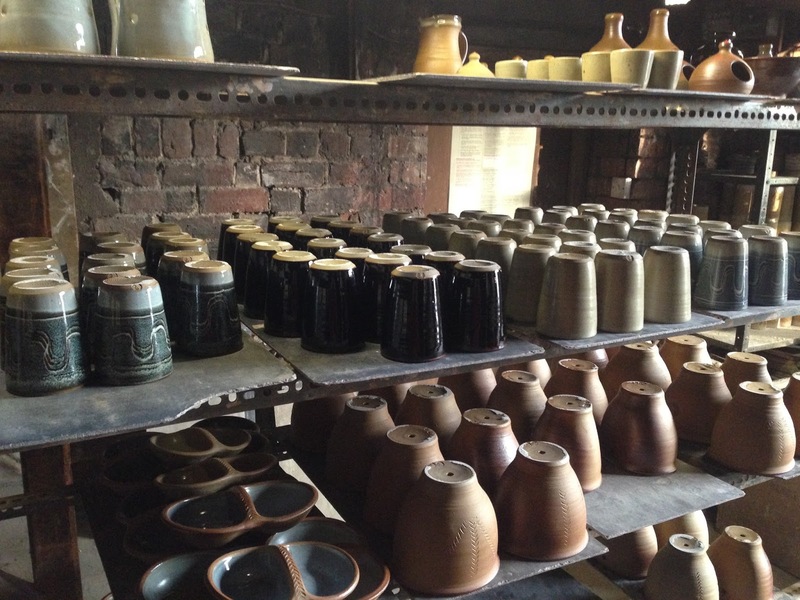 It represents a craft and trade that, even at the time of filming, was being left behind by other manufacturing processes - much like the utterly wonderful documentary of George Curtis at Littlethorpe Pottery. Country pottery (as I am learning!) is one of the main roots of what we do today. Obviously society has changed a lot in a hundred odd years, and the cultural position of pots within it, but I still think there is much to be held up to the light from those times, including a deep integrity that cannot be mimicked, but perhaps that is for another post. 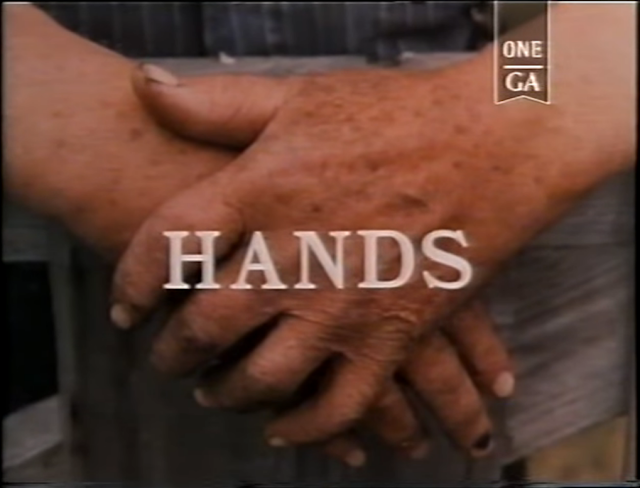 Both of the films portray the exertions and rewards of hard work. It is very easy to become romantic about all of this, but I do not think it is a danger as it can be elsewhere with culture. Most potters working today, I would guess, would consider themselves to be at least a little bit romantic, otherwise they would probably not undertake such a difficult, precarious way of making a living. 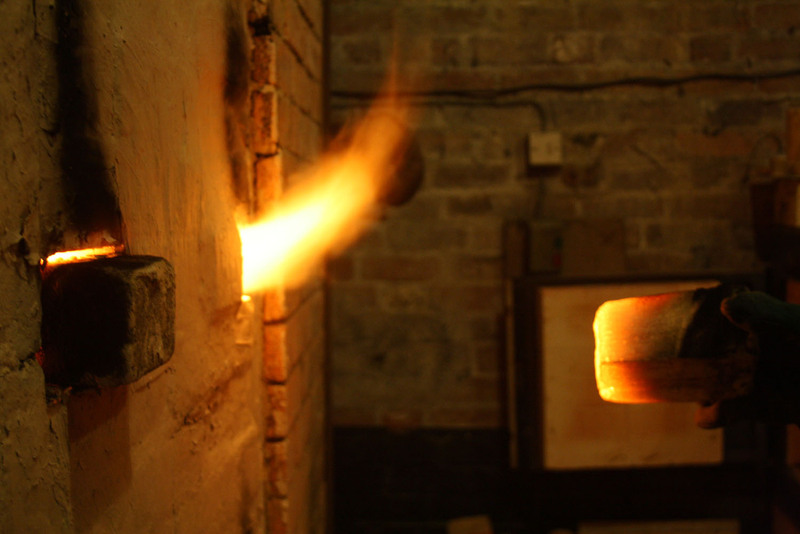 There is great risk in making a good pot, everyone knows it is very easy for things to go wrong in pottery, but the best pots lie on the very edge of that risk - every now and again, between the throwing, the glazing, the firing and a touch of something beyond your control, a pot will come out of the kiln that takes your breath away. David Pye's well-known distinction between things that are mass-produced and things that are made by hand is the difference between certainty and risk. The workmanship of risk, and the potential for these wonderful moments, relies on, he says, the "judgment, dexterity and care" of the maker. If you wanted to be very romantic about it, it is the combination of head, hands and heart. In Vincent Van Gogh's The Potato Eaters, he strived to show the reality of people at the end of a hard day of work. He felt that he could best show this through his depiction of their hands. 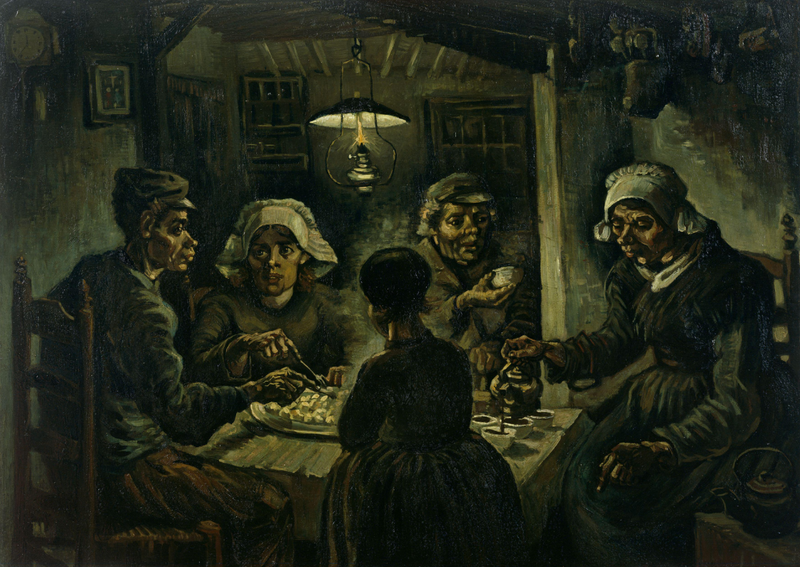 "You see, I really have wanted to make it so that people get the idea that these folk, who are eating their potatoes by the light of their little lamp, have tilled the earth themselves with these hands they are putting in the dish, and so it speaks of manual labour and — that they have thus honestly earned their food." From Vincent van Gogh's letter to his brother Theo van Gogh, Thursday, 30th April, 1885. A great deal of the work involved in making pottery is drudgery. There are dozens and dozens of small, laborious, in-between but essential jobs that need to be done. There is definitely a simple joy to physical hard work in its own right and to getting to the end of a day's work and looking at what you have achieved. But there is also a more subtle satisfaction that comes from the understanding of all your cumulative labour adding up to something bigger. 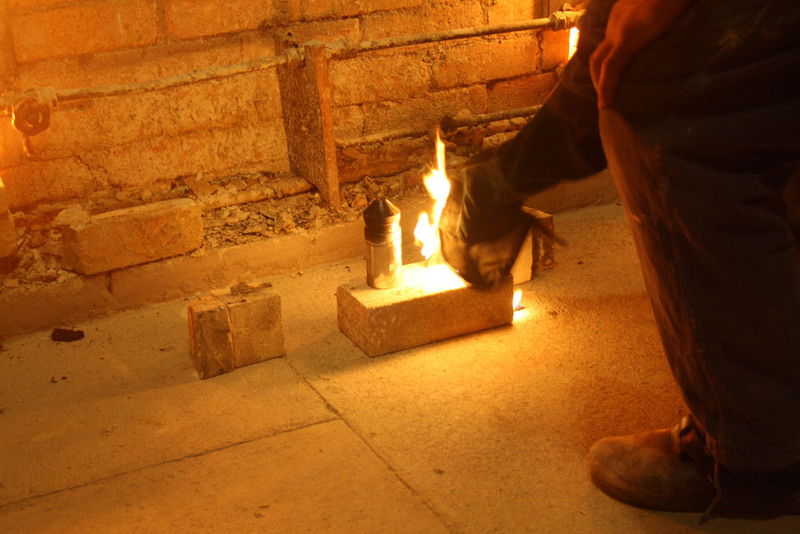 At Winchcombe, we mix clay and glazes and fire with wood. 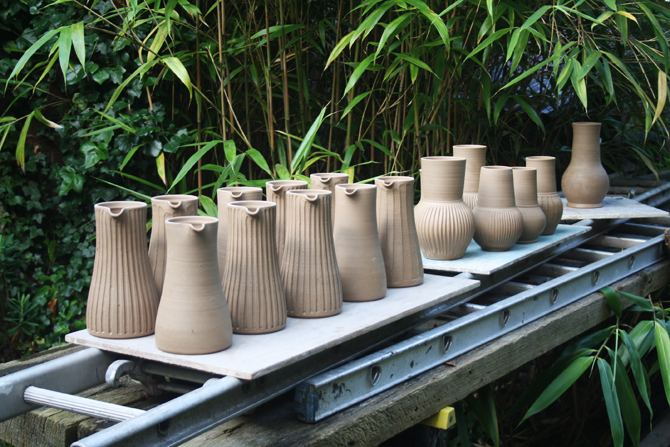 And these jobs get completed steadily, bit-by-bit, over days and days, in between throwing, turning, glazing and firing. On their own they might seem very distant from a lot of people's idea of what being a potter is like - day after day sat joyfully at the wheel throwing pot after beautiful pot, creating all the time. 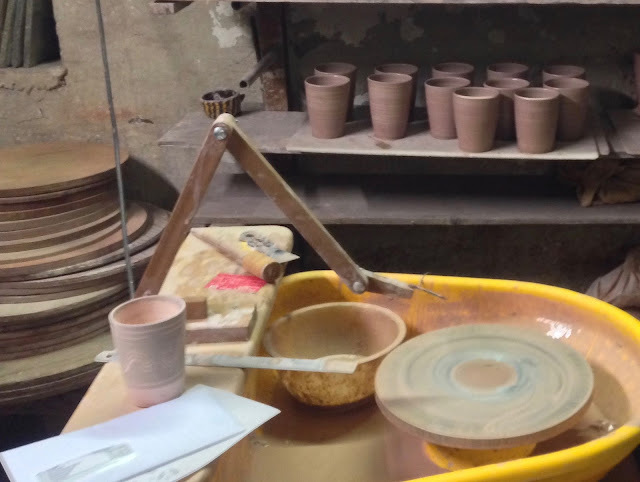 The truth is that throwing on the wheel actually makes up a relatively small percentage of what a potter does. 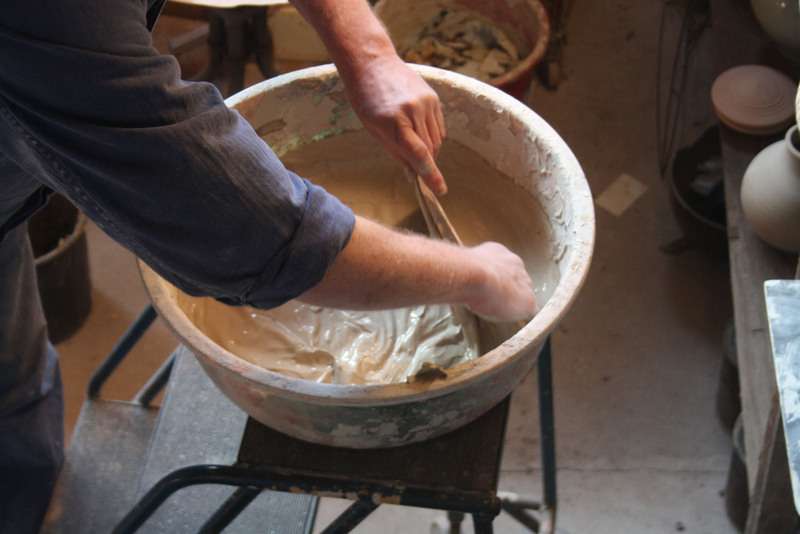 There is an enormous amount of labour that happens before, alongside and after throwing in order to make beautiful work in a pottery. One of the very first tasks I was asked to do when I started at Winchcombe was stacking wood into palettes, a full day of it. 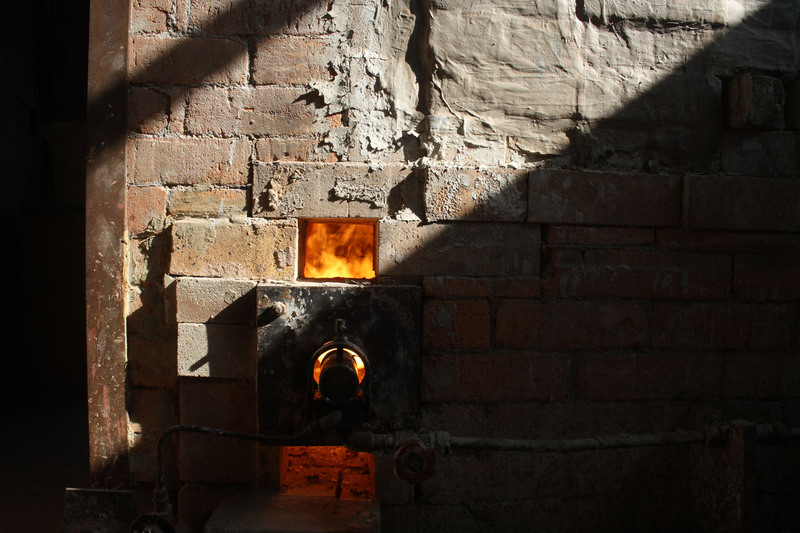 We fire our kiln with wood and it is enormously labour intensive, both during the firing and leading up to it. 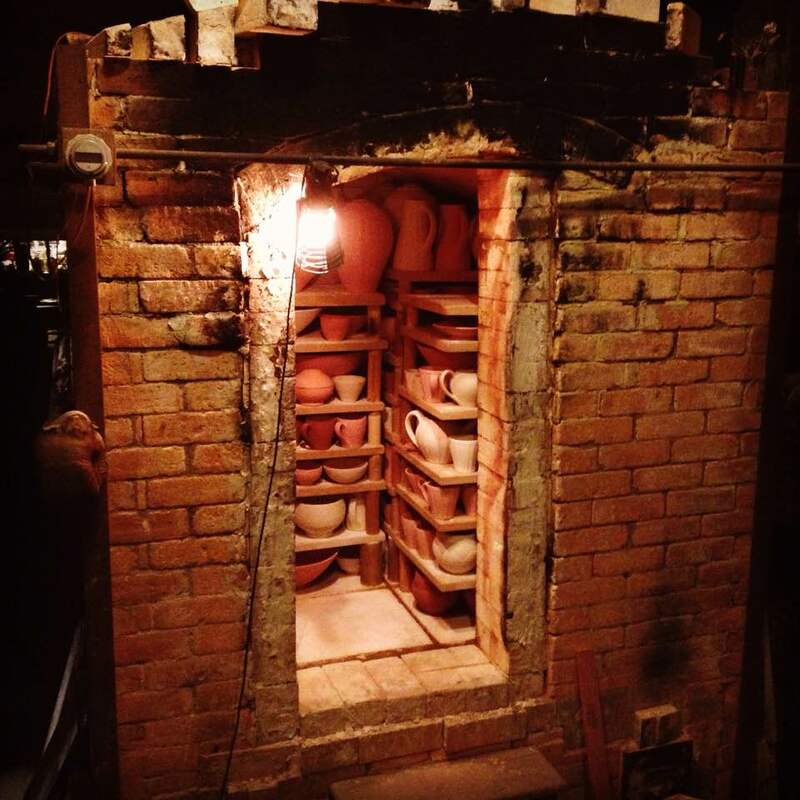 We get through roughly two palettes per firing and we generally fire the kiln once a month. It is hard work cutting and stacking the wood and we often have to devote a full day or two to it all in order to get through each new delivery from the sawmill. The wood needs to be cut to length for the firebox in the kiln, stacked and then seasoned for roughly a year before it is ready. 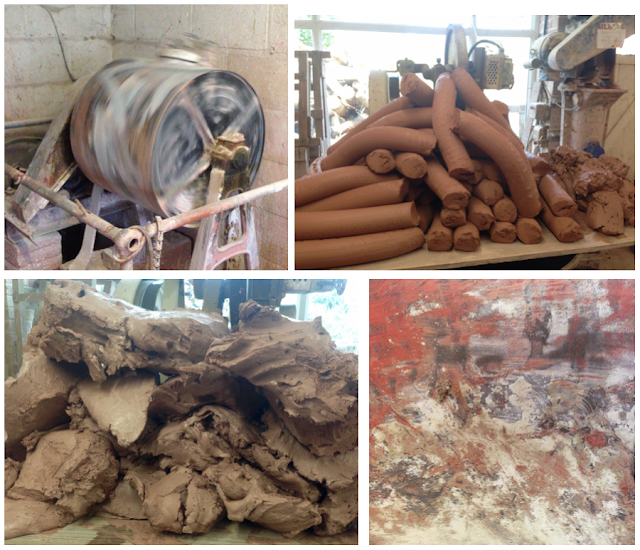 Clockwise from top left: The ball mill in action, mixing up a glaze; pugs of clay waiting to be passed through the pug-mill for a second time; a pile of the mixed clay body before it is pugged; the inside of the mixer, showing the powder clay and red iron sticking to the sides. 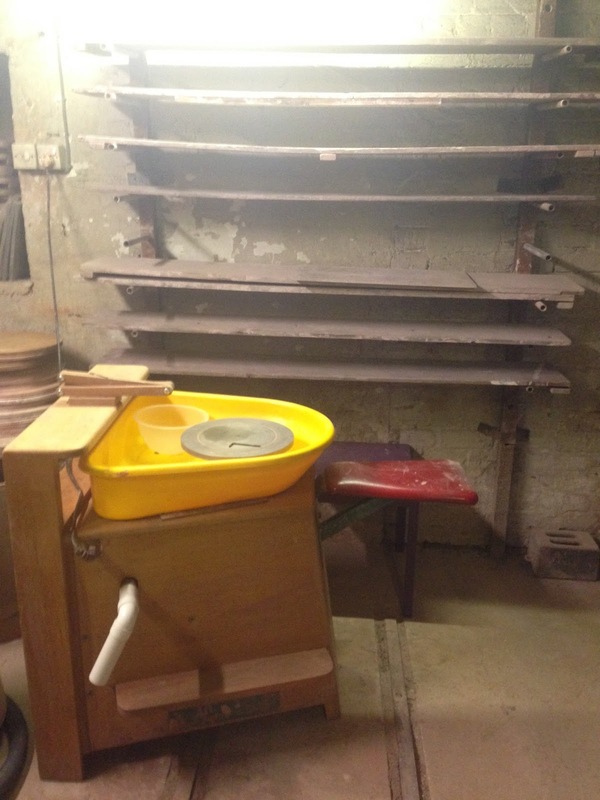 Glazes and slips need to be mixed, with the raw materials combined in a ball mill, the mixture sieved, and the right consistency achieved depending on the glaze. 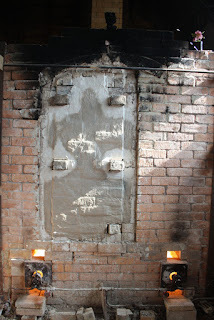 The kiln needs to be made ready, kiln shelves dusted with alumina, plate stacks put together, ash pits cleared. Bats and boards need to be scraped and sponged clean. I have also spent almost whole working days sieving sand - literally sieving out any small stones or larger grains so that only the finer material is left, but it all adds up. The sieved sand is combined with two types of clay and iron oxide in a mixer before it is left to mature (at Winchcombe, we use a wonderful Victorian dough mixer that was bought from the bakers in the town). Then the clay will be processed in a pug-mill before being ready to throw with. The beautiful colours of the pine and splitting the wood by hand when it is too wide for the fireboxes. All of these things and more need to be done within a cycle of making that leads up to a firing. So the cycles get repeated, month after month. These jobs are never done for good, they will always need doing again soon. 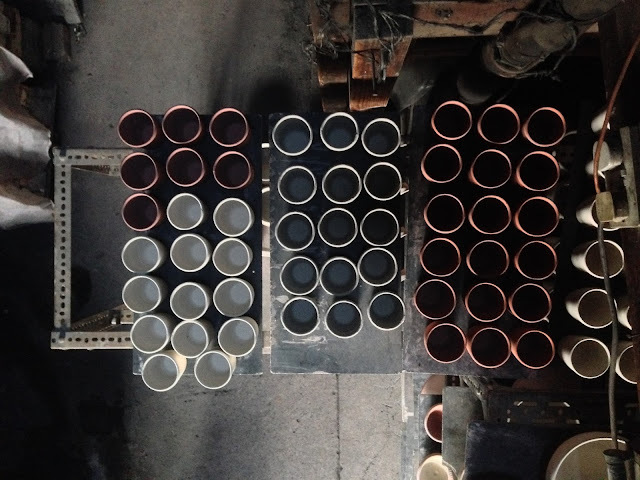 Even though our pots often have an individual maker's mark alongside the WP stamp, every single pot that we produce at Winchcombe will have passed through all of our hands and will represent all of our work. The work becomes devotional - intense concentration and care with the immediate task at hand, knowing that it is adding up to something much bigger. The hard work of it all, knowing this, becomes deeply satisfying. A finished, beautiful pot represents all of the accumulated hours of this collective judgment, dexterity and care. Winchcombe Pottery - a view of the workshop from the road. 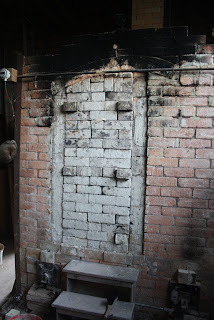 This is looking towards the kiln room and you can see the chimney sticking through the roof. 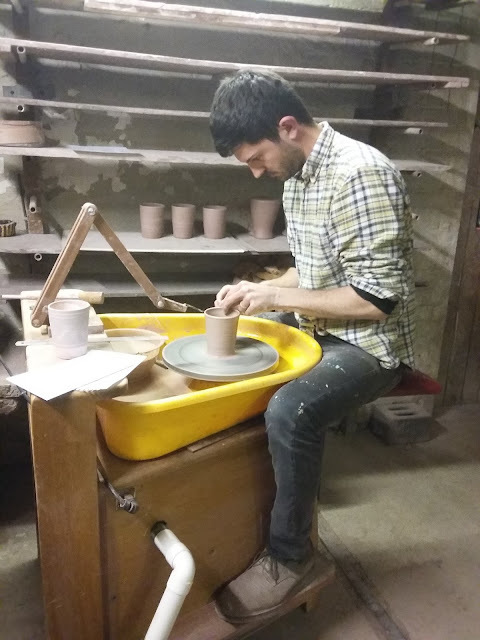 Hello, my name is Joseph Fuller and this is my first post for Adopt a Potter about being an apprentice at Winchcombe Pottery. 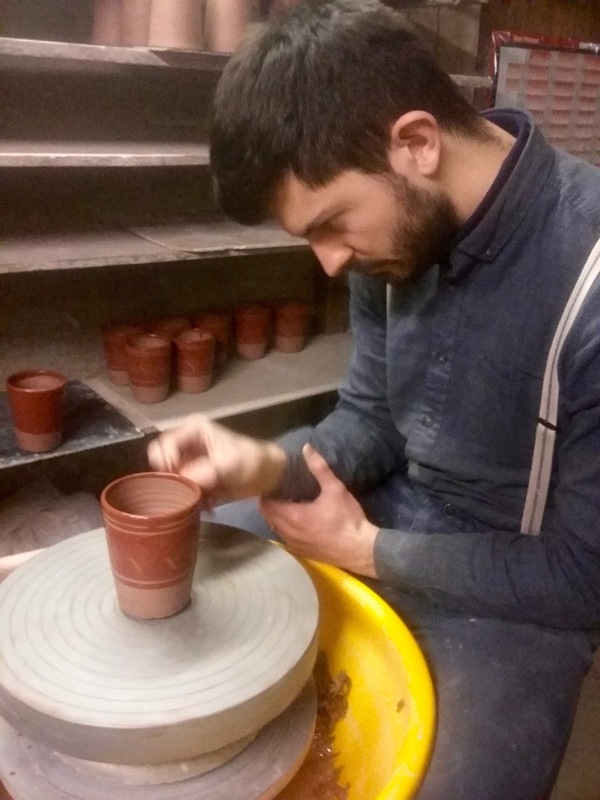 I started here at the end of 2016 and there are so many things I have learnt already and I will use this blog to post about the different aspects involved in working at the pottery. 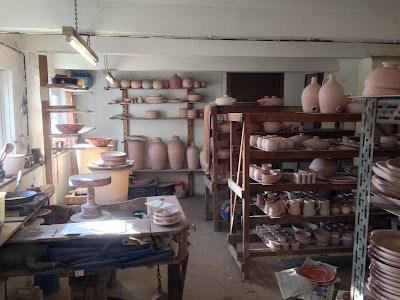 I also want to write posts about my thoughts on pottery in a wider sense and use the blog to chart how they develop as my knowledge and experience increases. First of all, though, I will just introduce myself a little with a bit of background. Outside the workshop, where we cut and stack the pine before moving it under cover to season for around 6 months. 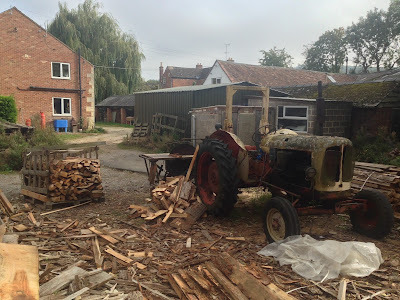 We cut the wood using a saw attached to this beautiful old tractor. Some years ago now, I studied at the Ruskin School of Fine Art, at the University of Oxford, concentrating mainly on painting and film, and after graduating in 2010 I worked as an artist’s assistant in Brussels for a while and then in Mumbai between 2011 and 2013. I then tried a number of different jobs, including time with Oxfam and as a teaching assistant in a secondary school. After moving back from India, alongside working, I spent a lot of time looking into finding a craft, but nothing ever quite seemed right. I missed working with my hands, which I had not done properly since university, but, importantly, felt that I wanted to find something away from art (I am hoping to write about this move away from art and towards craft, in greater length, at another time.) I really wanted to learn a skill, to be able to get to the end of my life having committed to a craft and attempted to really understanding something. The glazing room at Winchcombe - this is where the biscuit-fired pots are glazed before being taken through to the kiln room for a firing. Then, as a Christmas present, my parents paid for me to attend a ceramics evening class at my old sixth form college. I had no expectations at all. I was very fortunate: The course was led by Graham Hudson – a wonderful, patient teacher. About half way through the course we had our first go on the wheel. I was attracted by the difficulty of the process and it felt like a challenge, especially with my initial struggling compared to the grace of Graham’s throwing. More immediately, I was drawn to the directness of the relationship between my hands and the material. 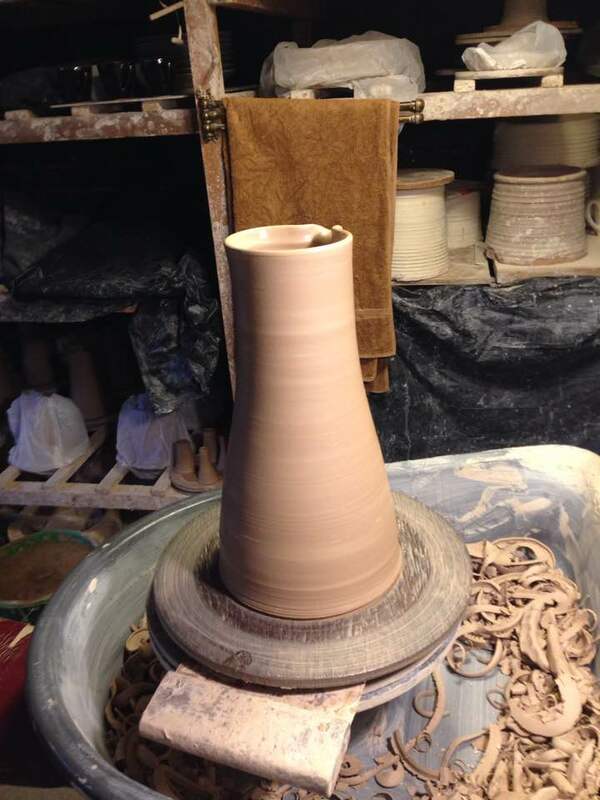 I decided there and then that I wanted to work towards acquiring the skill of throwing and to become a potter, and to challenge myself to commit to what would clearly take years and years of serious hard work. After the course, I was fortunate to be able to spend a year at Dove St Pottery with David Worsley in West Yorkshire, for my invaluable first experiences of a pottery workshop. My wheel at Winchcombe on day 1 - completely clean and spotless, before I have thrown a single pot on it. 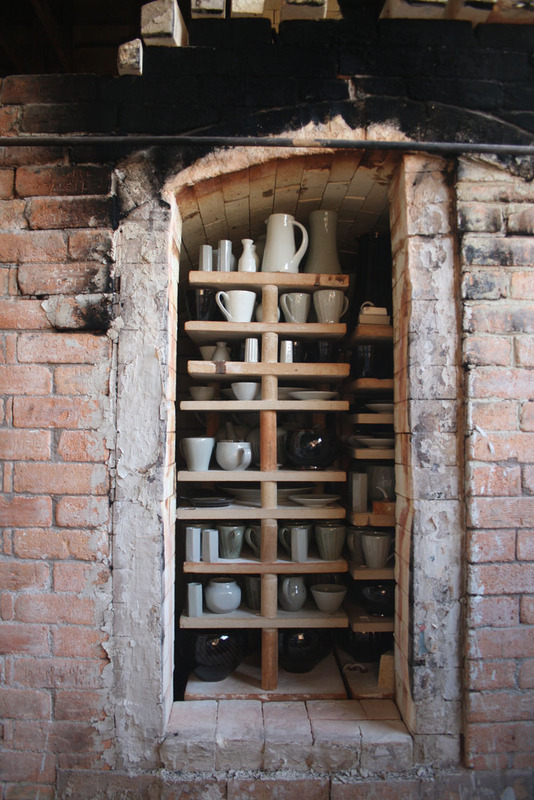 It is quite different now and one of my favourite feelings in the pottery is the rhythm of shelves filling up and emptying as you move through the making process. 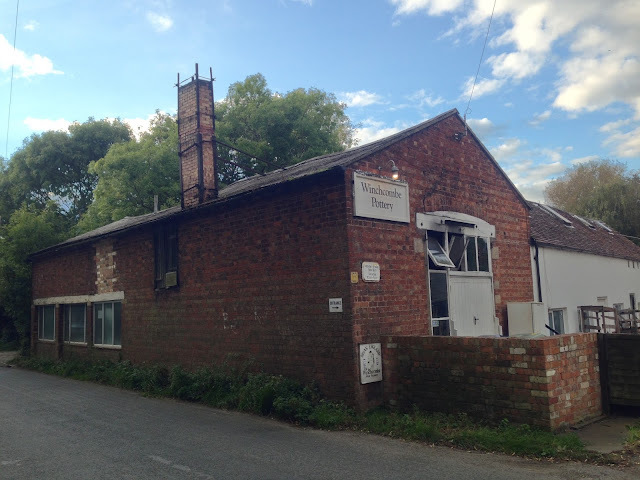 That brings us up to now, and I am very excited to be joining Winchcombe Pottery, which will be an amazing place to develop my skills. There is so much history at Winchcombe, which in truth is quite intimidating for someone at such an early stage in their career, but I see it is as one of the best challenges: to study it, to understand it, to respect it and to then learn to be confident and humble enough to make your small contribution to it all. 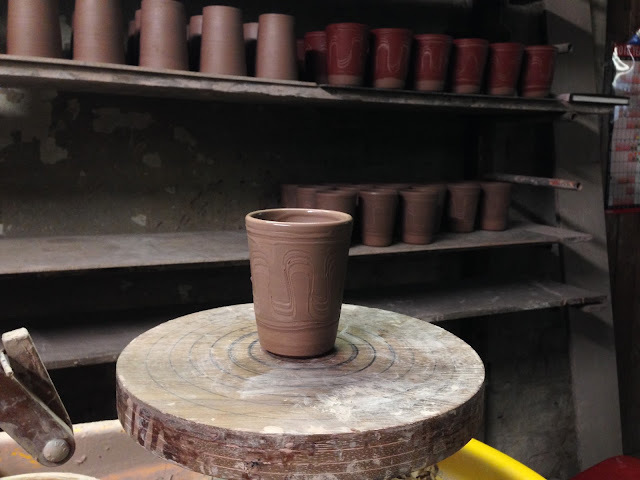 I am looking forward to experiencing life as a production thrower and to being part of a team at a pottery. 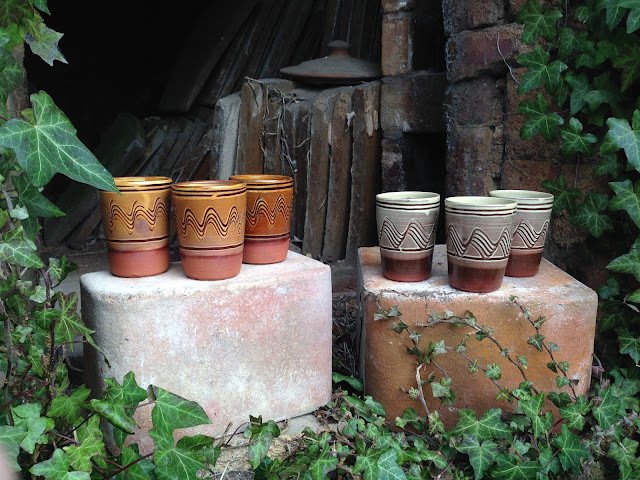 I am keen to learn about wood-fired kilns, something I have no experience of, and to explore making slipware alongside the standard range. Up until now, my own work has tended to be quite minimal in design with quiet glazes, but I am going to take this year as an amazing opportunity to experiment and explore and to be open to picking up different techniques and languages within making pots, with no fixed ideas of where my work should go. So, this is the beginning. A view from Cleeve Hill, a few miles away from the pottery. 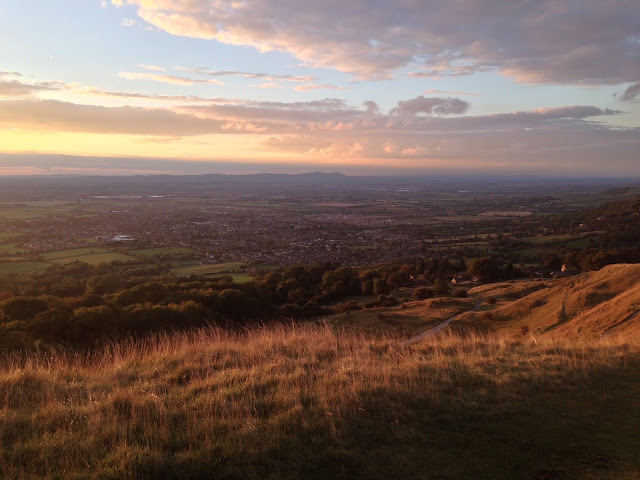 I went for a walk up here on the first evening when I moved down to the Cotswolds. It is an amazingly beautiful part of the country and it was a great place to ponder this next stage in my life. So, Christmas came and went, and we're just now just about recovered. 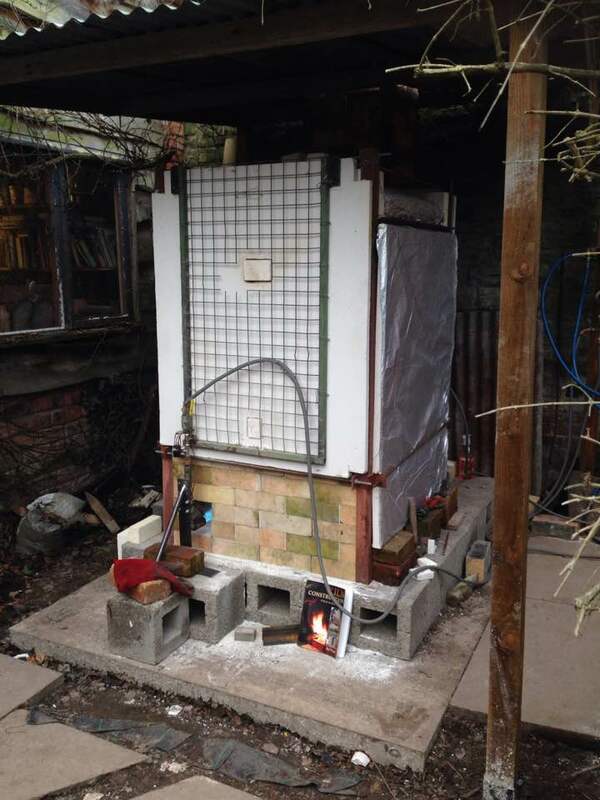 Here's a picture of the late-night oil-kiln pack we managed to get through just in time for the last Christmas rush. It was a really special firing for me for number of reasons, one being that I got to pack the majority of it. 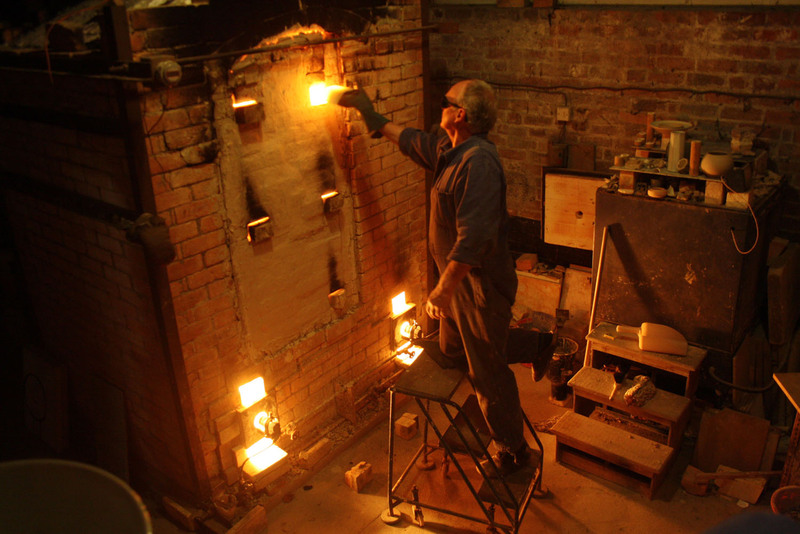 Its a complex task that combines grouping together pieces of a similar size, and placing certain glazes to suit certain areas within the kiln. 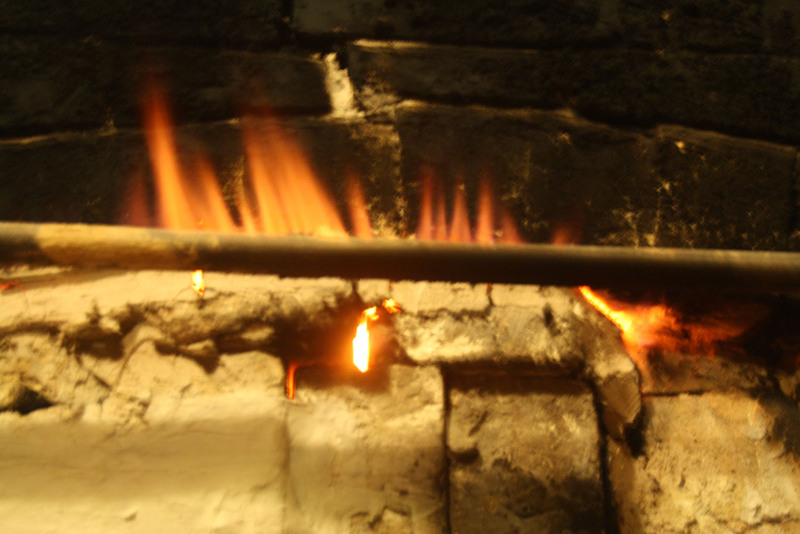 An example of this would be, placing Tenmoku on the outer edges of the shelves, into the firebox (the area in the kiln in which the flames are directed), because it can take a lot of heatwork. Or placing the combination chun and plum glazes, with wax resist, higher up in the kiln, because if they get too hot, the brush lines will be lost and the glaze may run off the pot and fuse to the shelf. The firing was successful, bar a bit of under-firing at the bottom. This caused some of those wax resist decorations to come out white-ish instead of a the shiny, brown and speckled blue we hoped for. I have continued to purse throwing larger forms, with some success...and some disaster :) Below is a photograph of a 8lb jug form I have been practicing. Its very, very satisfying to make something so big when it is successful. 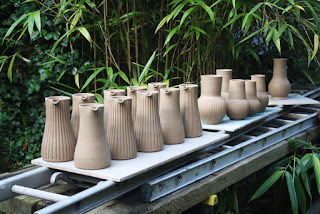 I could justify keeping only four, after turning and fluting (another danger zone for error) and handling, and will fire them in our first firing this year. 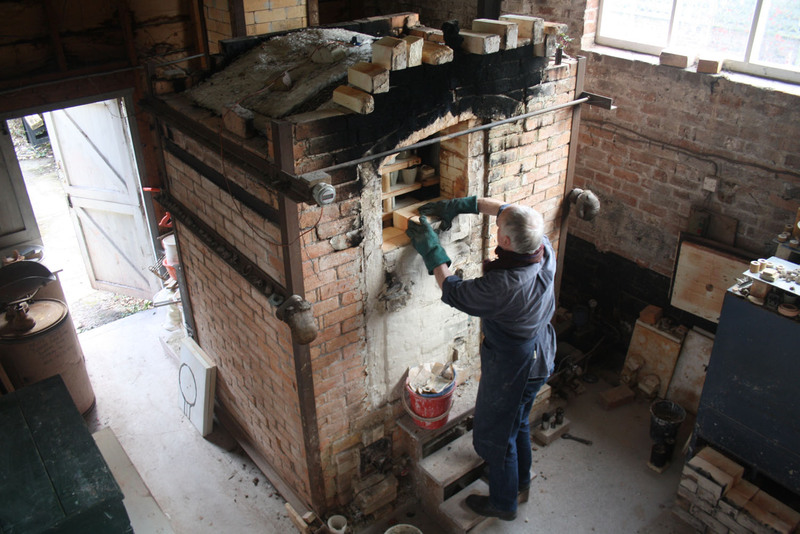 January has been an opportunity for us to get on with finishing the Gas Kiln too. 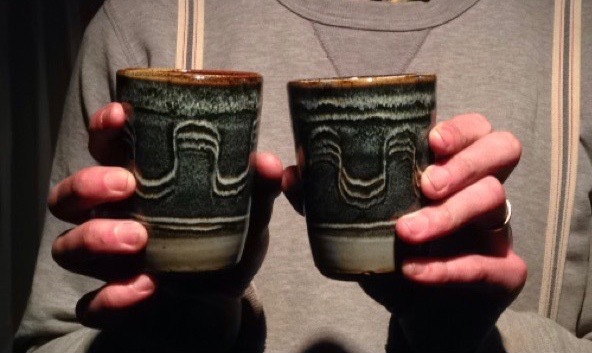 We did our first biscuit firing a few weeks ago which was overall pretty successful. It was a lot noisier and smellier than we had imagined, but it got up to 970 degrees (after getting stuck at 930 for a while) and the pots came out just fine. Helping and watching Matthew to put it together has been a really valuable experience. 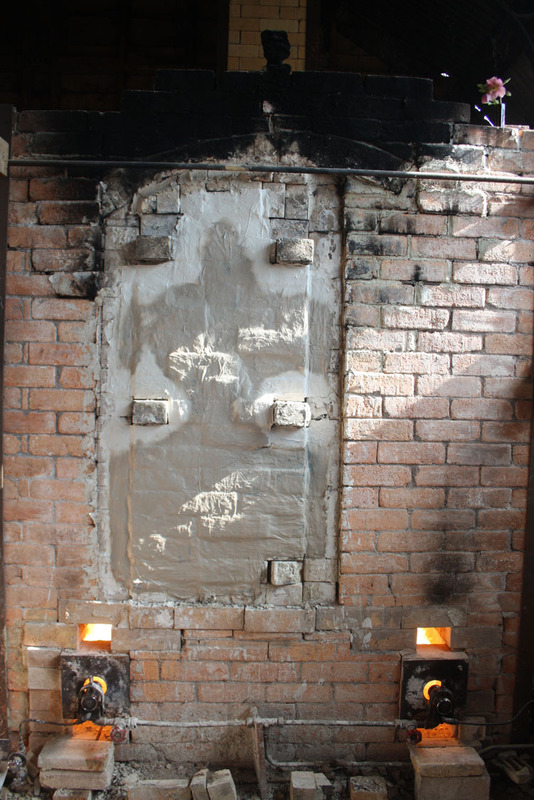 Its really given my understanding of how built kilns work greater depth. I may have even caught the bug! In June last year, I got the opportunity to go to the Earth and Fire ceramic fair at Rufford with Adopt a Potter. 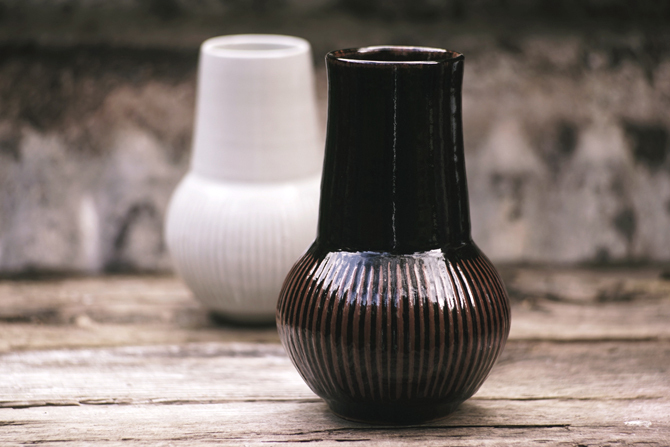 Seeing all the beautiful pots opened my eyes to lots of different ways of firing, and I'm most definitely more than intrigued by wood firing. I love it when we get variation of tone over one pot in the oil kiln, and it would seem that this is all part of the beauty of firing with wood. I hope to learn more soon! And just to finish, here's a picture of me in my December get-up. We do our glazing in the kiln shed, which is literally a big shed and not at all a warm space to be. The plastic bags are because I refused to swap my boots for my usual workshop shoes (chef's Birkenstocks - they're brilliant! 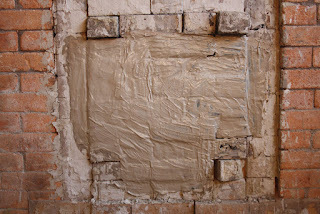 ), but iron oxide (a key ingredient to many of our glazes) on leather is never a good thing. 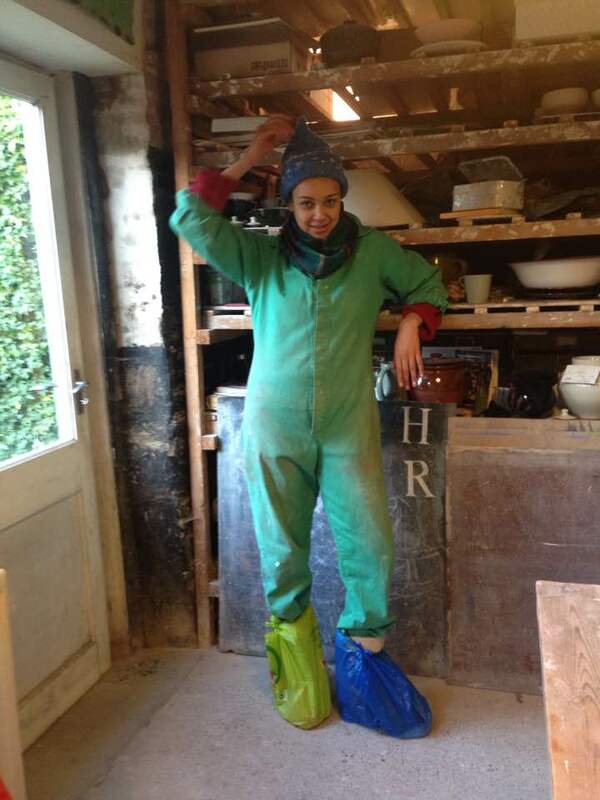 I won't tell you how many layers I have on under that boiler suit! Sometimes you do have to sacrifice looks to get the job done. Hello again! 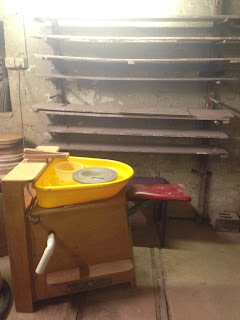 I thought for this blog post I would share with you a typical day for me at the pottery. I have been with Andrew as his apprentice for a little over two years now, and, although every day is different, there is always some sense of rhythm and strategy to what we do. 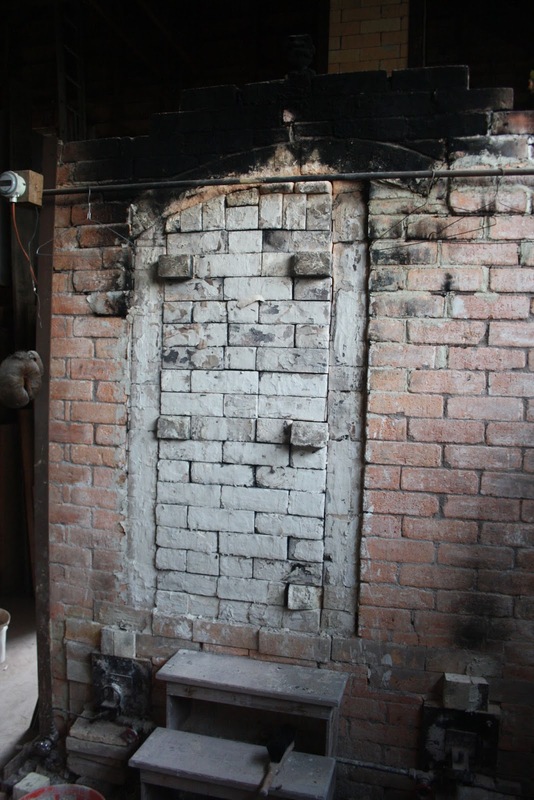 The kiln at the pottery is relatively large, with about 9 cubic ft of packing space. 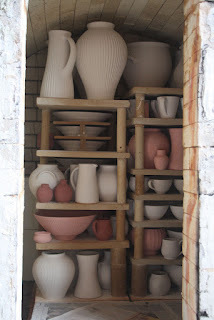 It takes 250-300 pots (including small ones) to fill, and usually 2-3 months is needed to create the volume and variety of pots required for a glaze firing. 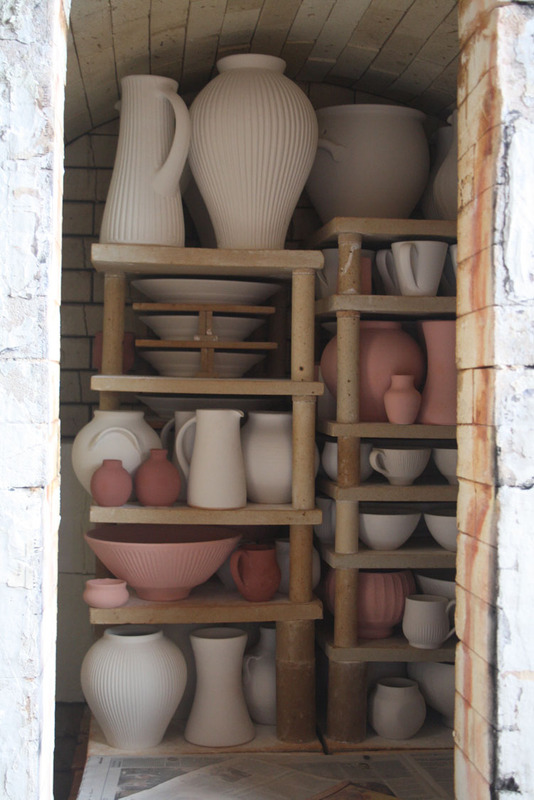 A variety of shapes and sizes is important, both to get a ‘good pack’ that will force the flames to work their way around the kiln, and to ensure we have a good selection of pots to put in the shop in the end. 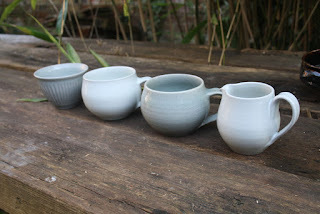 I am responsible for making the smaller items; espresso cups, mugs, bowls, little vases, etc. 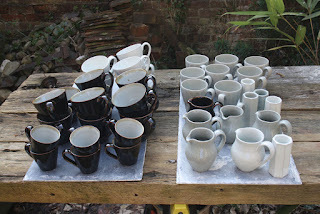 Andrew was keen that I learn all parts of the process, so I throw, turn, bisque fire and glaze all of the work I do. 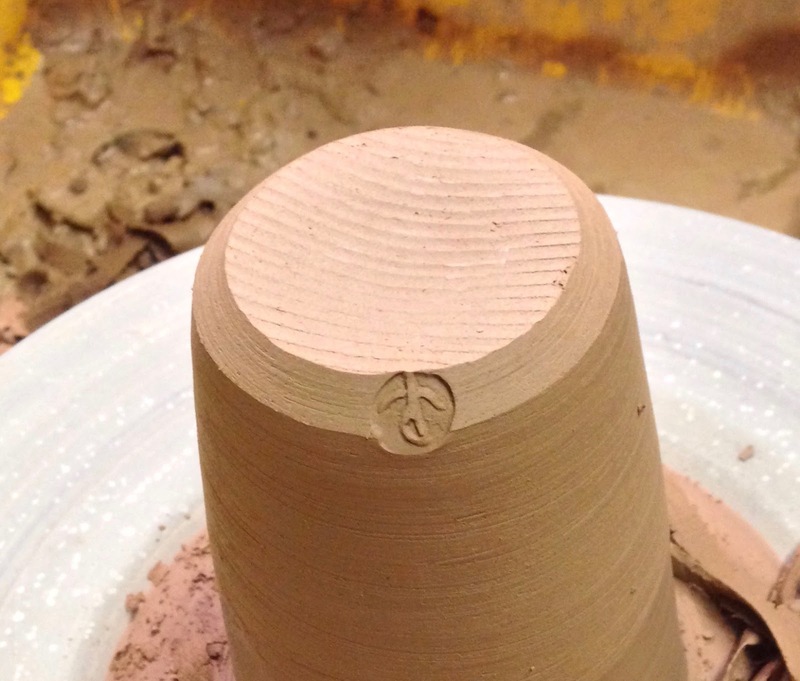 Any work I make for the pottery gets marked with the pottery stamp, Andrew’s work is marked with his own and I have a stamp my personal work too. The day usually begins for me at 9am, and usually ends around 6 or 7pm. There is coffee at 11am, lunch at 1:30, tea at 4pm - cake, always. On this day, I began with turning some espresso-cup saucers. We don’t usually make these but somebody had asked especially for them, and it became a good opportunity for me to learn a new trick or two. Pictured below is one of the saucers in a shallow inverse chuck (support) that enabled me to turn away the foot rings quickly and without damaging the rim. Andrew had suggested that I also make a regular chuck for cutting away the cup indent. I forgot to do this but managed to use the first chuck again successfully, with just a little soft clay to support it. Andrew saw this and said nothing - which usually means he doesn’t entirely approve, but is willing to let me go ahead, and if I mess it up I wont forget the lesson. Learning from your own mistakes is very important! After coffee and before lunch there was time to make a quick dash to see Mark Griffiths who has a pottery a few miles away in Culmington. He was firing his new wood kiln and had invited us over to see it in action. I had never seen a wood firing and was very impressed and intrigued, I would really like to fire with wood in the future and have been reading up about it recently. After lunch, it was glazing time. 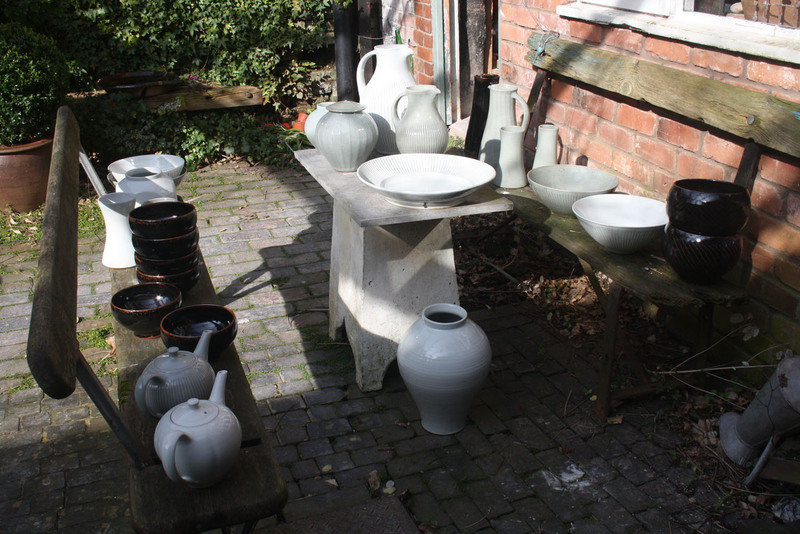 I left the saucers to dry in the shade (of which there is plenty in the beautiful garden), and headed to the kiln shed to make up some of my first ever glaze tests. I have focused on making, and learning about form and throwing until now, and have only really just felt ready to start looking at coming up with my own direction for colour and glazes. 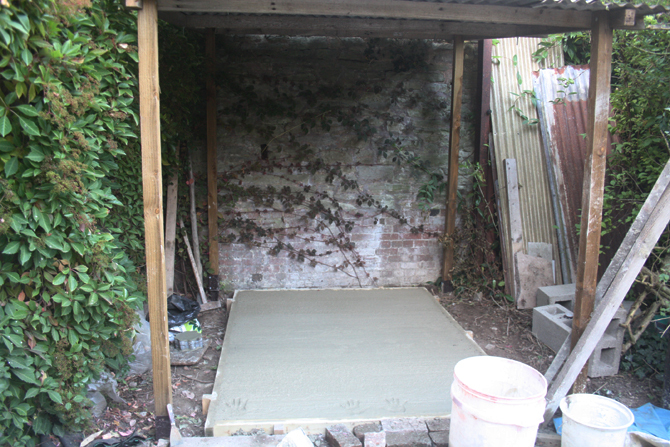 It was a very timid start, but a start at least! 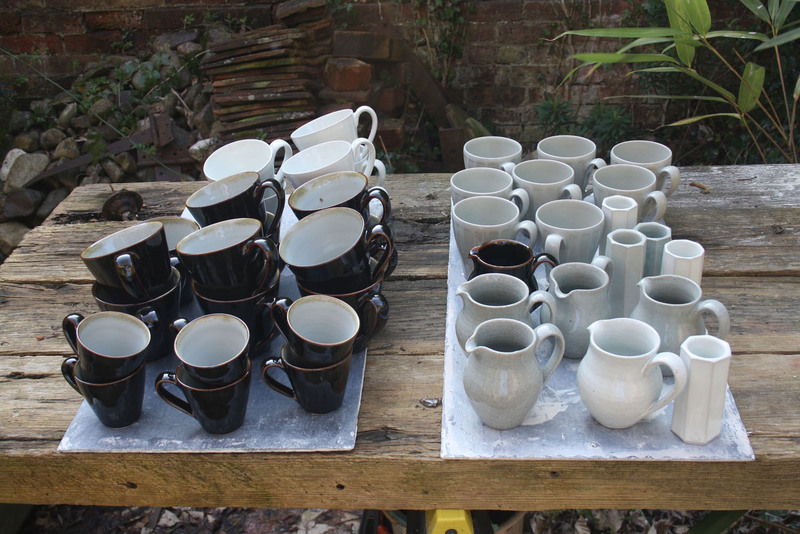 Saucers and vases drying in the shade. 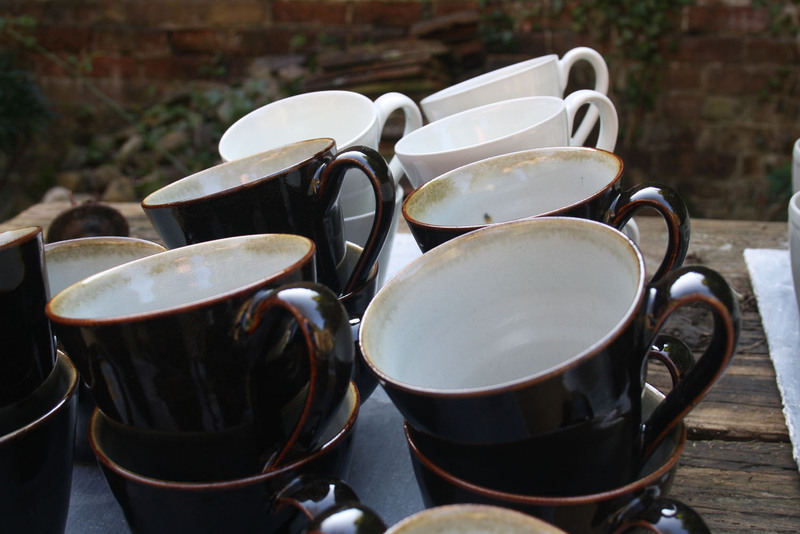 Tea was had at 4, and then I set about the final task for the day; making sense of the great number of bisque fired pots that were waiting to be glazed. I needed to sort out which of my pots needed to take which of the 10 or so glazes we use, and make sure each of those glazes were made up and of the right consistency to use. 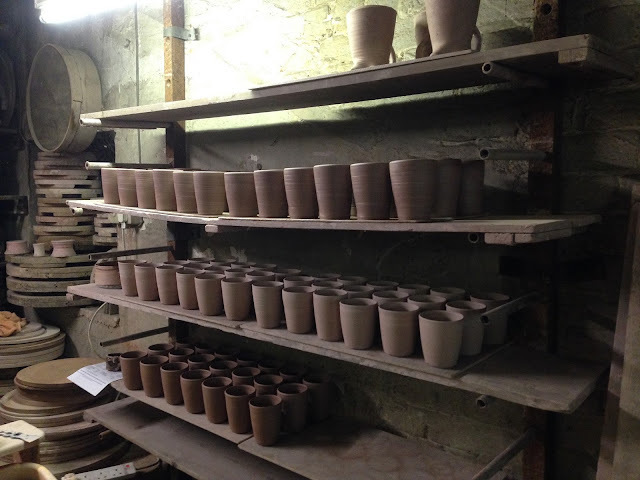 Bisque fired pots, ready to be sorted and glazed. With that job completed, I had just enough energy left to climb out of my overalls, and another day was done :).